Figaro belts out a song. You've heard this before ...	Immortal lines, indeed, particularly when lashed about in the original Italian and torqued into a tongue-tying frenzy: "Ah, bravo Figaro! / Bravo, bravissimo! / A most fortunate man indeed! / Ready to do everything / Night and day / Always on the move / A cushier fate for a barber / A more noble life, is not to be had / Razors and combs / Lancets and scissors / At my command / Everything's there / Here are the tools / Of my trade / With the ladies ... / with the gentlemen ... / Everyone asks for me, everyone wants me / Ladies, young lads, old men, young girls / Here is the wig ... the beard is ready ... / Here are the leeches ... / The note is ready ... / Here is the wig, the beard is ready / The note is ready, hey!" "Figaro! Figaro! Fig - GAH - ro!!!!" Whether it was by Woody Woodpecker, Bugs Bunny, Porky Pig, Daffy Duck or Homer Simpson, all cartoons that have joyfully romped through Gioacchino Antonio Rossini's arguably most-beloved opera, "The Barber of Seville," for many, the melody simply defines "opera." Despite the references in the libretto above, this is not "Sweeney Todd, The Demon Barber of Fleet Street." Nope. That's Stephen Sondheim's baby, and Sondheim ain't much fun. Even so, Rossini's "Barber," one of the five most-performed operas in the United States and the object of cartoon mayhem, has a pedigree, largely through the figure of Figaro, a royal valet with a talent for matchmaking. 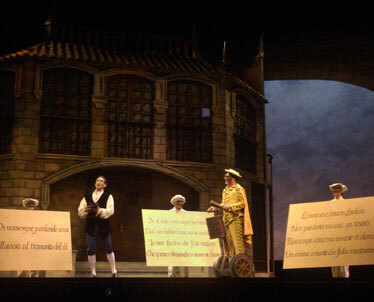 Figaro is the creature of French playwright Pierre Augustin Caron de Beaumarchais, who wrote at least three plays featuring his scheming hero, all of which inspired operas. Giovanni Paisiello whipped out an opera, followed by Nicholas Isouard, who was then followed by Rossini, who knocked out "The Barber of Seville" in something like three weeks. But Mozart beat them all, writing "The Marriage of Figaro" three decades earlier. 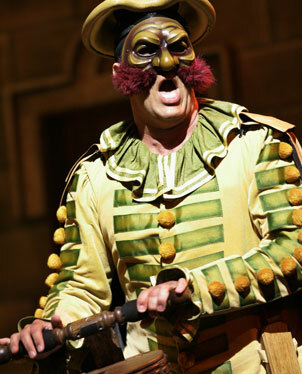 What other fictional character has two operas centered around him? Zachary Stains, left, is Count Almaviva and Stephen Powell stars as Figaro the Barber in Hawaii Opera Theatre's production of "The Barber of Seville." Rossini's edition was despised at first. The premiere performances in 1816 were attended by rabid fans of Isouard's opera -- also named "The Barber of Seville," go figure -- and they created such a ruckus, and engineered some nasty onstage accidents, that Rossini's debut is also notorious in the opera world as a colossal flop of epic proportions. Luckily, Rossini's cheerful buffa gained its own fans over time, and so here we are in Honolulu, with Hawaii Opera Theatre's take on the subject. Directed by New York-based choreographer and director Larry Edelson, the Hawaii production supposedly returns to the madcap comic origins of the piece, including the use of masks, and don't be surprised if there's a pratfall or two. 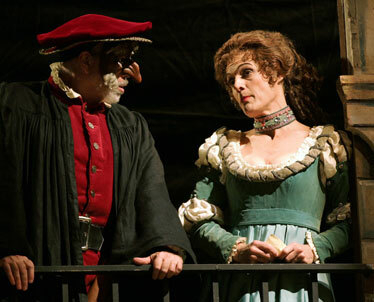 The performance features Christine Abraham as the lovely and somewhat unavailable Rosina, Zachary Stains as Rosina-besotted Count Almaviva, and Stephen Powell as the wily Figaro. All three are making a HOT stage debut here, whilst Jake Gardner (Dr. Bartolo), Jamie Offenbach (Basilio), Dorothy Byrne (Berta) and Patrick McNichols (Fiorello) are all veterans of the Blaisdell boards. But if you miss it, you'll have to make do with Bugs Bunny. Jake Gardner plays Dr. Bartolo and Christine Abraham is Rosina.